Who am I kidding? There is too much info following, but I ain’t deleting. To my male readers, my apologies. To my female readers, we need to create a chocolate support network..
Hubby and I have been seriously discussing attempting to become parents to a second bundle of joy. Thus, this past week, when I had my obligatory exam with the gynecologist, I had my IUD removed, and will be making the transition to the pill while we continue to debate our options and finances. An unfortunate side effect of having removed the IUD is having my first period in five years. Right now, I crave chocolate like the undead, zombie hordes crave brains. I’d forgotten the joy (ha!) of tampons, though I constantly kept a stash on hand. I’m endlessly hungry, too, which makes me irritable, after getting on the scale at the doctor’s office, and realizing that all of my dieting efforts have resulted in a net gain of five pounds. However, my menstrual crabbiness is resulting in an explosion of sewing, as I’d much rather spend time with my fabric than people right now. I’ve caught up completely on Scrappy? Sew Bee It! Blocks. This is both a boon and a curse. A boon, because I’m finally caught up. A curse, because I’ll have to ship them all out and pay the mailing fees. 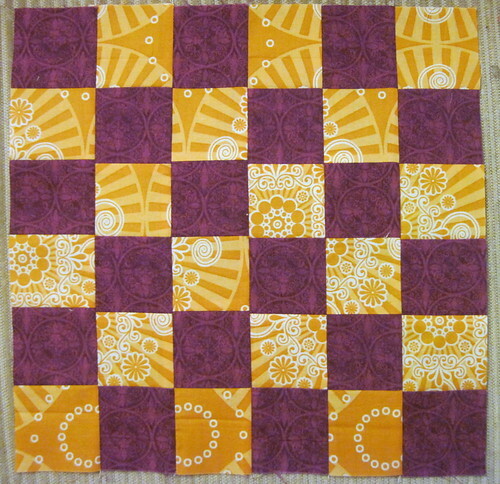 Two thirty-six patch blocks for Deborah, aka MissLuella. These pretty much epitomize my stash. 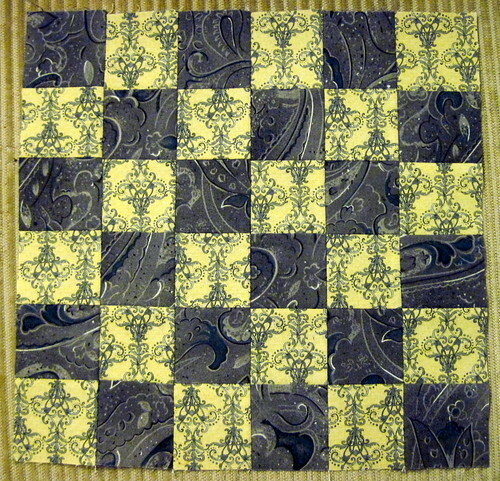 Bold, strong color, which dominates my fabric stash, because color-shy I am not. A smaller portion of my stash is dedicated to neutrals and decidedly elegant prints. Two unassembled scrappy, string Spiderweb blocks for Christiane, aka Caillean Z. She’s hoping to get 12.5″ spiderweb blocks out of these, and requested that we not assemble the four quadrants, so that she can mix and match upon receipt. 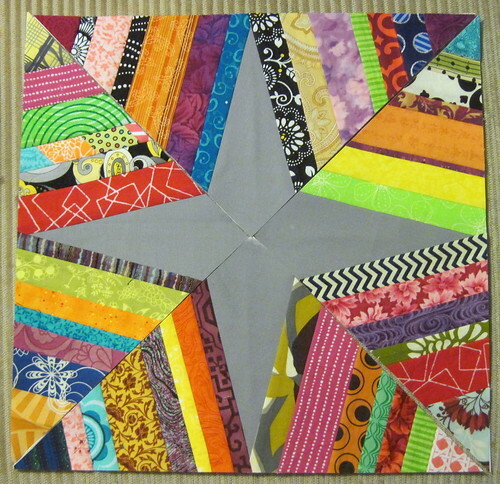 My paper piecing templates came out too large, but I left them over-sized, rather than trim down and make a mistake. 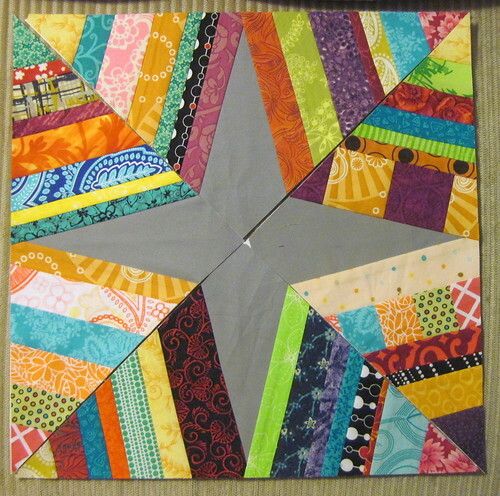 I included some pieced strings – I save a lot of scraps, especially if I can easily include them in a string project like this. Tags: Blocks, Scrappy? Sew Bee It! I see I am brave on who decided to comment…hang in there it will be over in a few days until then do some sewing for yourself! The plan is for me to hunker down for the remainder of this weekend – I’m already on the home stretch of Aunt Flo’s visit. I don’t know if I have to thank you or your hormones for the fantastic blocks. 😉 But I’ll be a very lucky girl to receive them. I blame the hormones, for the moment, LOL.